Happy Monday morning, everyone! You all know we’re all about beautifying mitzvoth and/or revealing the beauty inherent in them, here at Jewish Latin Princess. Thus, with that in mind and to get us in the spirit of the upcoming holiday of Chanukah, I present to you this round up of beautiful kosher menorahs (chanukiot). Just imagine having any one of these beauties illuminating your home! Kosher, you ask!? All of these fulfill the requirements for the menorah to be kosher (or fit to do the mitzvah). I’m specifically referring to their design, as there are other requirements to performing the mitzvah of lighting the menorah properly. (More information here and here.) Design-wise, we’re looking for four things: a- that the menorah be one structure, meaning all the 9 pieces be together and not separate “candle holders” kind of sitting next to each other; b-that the candles all be in a straight row; c- the candles be the same height; and d- the shamash (candle that kindles the other lights) be placed apart from the other lights (ie. higher, or outside of the row). 1 || Carrara Marble Menorah: Menorah made out of carrara marble. What’s not to like!? 2 || Dwell Studio Menorah: This one is beautiful and minimalist and the price is very reasonable for such a unique modern design. 3 || Jonathan Adler Bel Air Menorah: If you favor orange, it comes in orange too. It’s kind of fun! It’s a bit out of my comfort zone but I appreciate its design and fun colors. 4 || Michael Aram Menorah: I really like the sculptural look of this one and the gold gives it a really nice modern edge. Not to mention that the gold reminisces of the menorah in the Beit Hamikdash (Temple) which was carved out of one solid piece of gold! Can you just imagine!? I wish I could see this show stopper, Temple Menorah in person. Actually, we will, G-d willing, see it very soon!!! 5 || Chabad Bagatel Menorah: Wow! 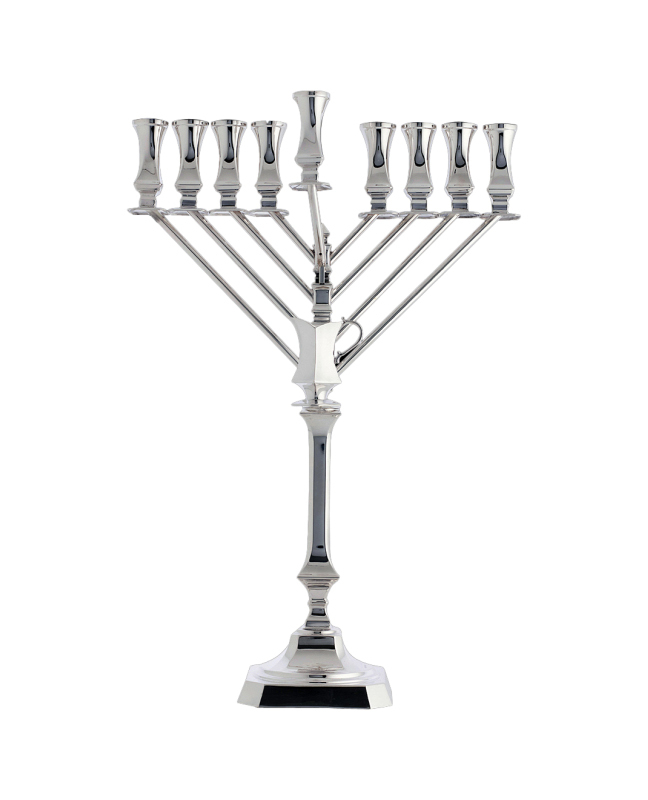 This is a stunning silver, Rambam shaped, menorah. Not only is silver a great way to beautify the mitzvah, but did you also know that according to the Rambam, the menorah in the Beit Hamikdash had this awesome diagonal-branch design, as opposed to the curved shape we see more often? (Please read more about this here, because it is truly fascinating.) Plus, here you get to light the Chanukah lights with oil, which is an added way to beautify the mitzvah. We own a silver Rambam shaped menorah, which is not only beautiful, but has great emotional value, as I chose it for my then chasson (fiancee) as a gift when we got engaged… ten years ago TODAY! Unfortunately, a silver piece broke during one of our moves, and I have yet to call New York and look into getting it fixed. It’s on my to do list every year… yikes! I wish I had found a picture of it online to show you, because it is beautiful, although more traditional than this one. And even though I still love ours, I’m just stunned by this more modern take on the traditional silver Rambam shaped menorah. Maybe, I’ll be saving up $4,000 to invest in this one for next year. Oy! It would certainly make a beautiful anniversary gift for my husband. Which of these is your favorite? Would you use some of these modern versions of the Chanukah menorah or do you prefer something more traditional? I love these! So modern….what a great round-up. If I had to get one I would tend toward the modern ones you have here. Love 1,2 and 4. My favorites as well. Oh but I’m stunned over 4!